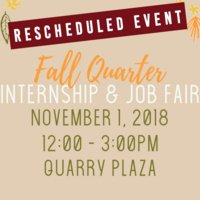 Rescheduled event: Now on 11/01 12pm-3pm at Quarry Plaza. Network with a variety of companies hiring for full-time or part-time positions, and internships! From science and technology, to nonprofits and local organizations the Fall Internship & Job Fair has something for everyone whether it's an internship, gap year program, or a post-graduation career.